Gemini Home Improvements is superior to other companies because the owner, John, is on the job every day and takes pride in each job he does. His attention to detail will surpass your expectations. John is an experienced professional who is reliable, efficient, creative and very easy to deal with. He will help you with your project from obtaining permits to helping you choose the right material and fixtures for your job. He will make creative suggestions to assist you in making decisions on your project and he will work with you until your job is completed to your satisfaction. If there is damage to your home, Gemini Home Improvements will even assist you in working with your insurance company to get the job done and expedite the project. Gemini Home Improvements did an awesome job replacing our old wood deck with a new composite deck that is now almost twice the size. I would highly recommend Gemini Home Improvement to anyone looking for a reliable, honest, high quality construction company. John (the owner) and Rob’s attention to detail and quality is what really made them stand out. They take pride in their work and it shows in the finished product. John’s commitment to making the customer happy is what makes his company so much better as compared to many other contractors I have used in the past. I also loved that when they started my job, they stayed on my project exclusively until it was finished. They showed up on time every day, and stuck to the schedule that they had outlined. I knew that they had other jobs lined up after mine, but while they were working on my deck, I was their priority and only project. 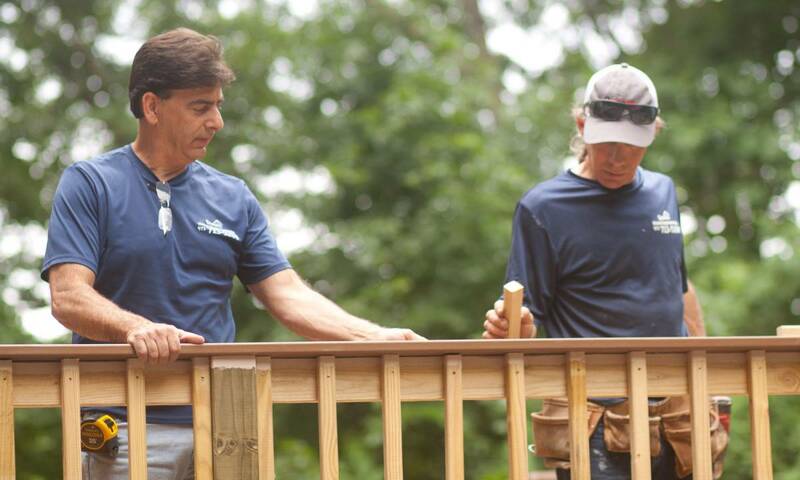 John worked with us to help design our new deck and apply for the permit, was there on the job every day until it was finished, and then worked with the town inspector to get it all approved. Thank you again John and Rob for a job well done. We have done numerous major renovation jobs over the years always putting them off as long as we could, dreading the entire process. All of that changed once we experienced Gemini, now we actually look for projects to do. John gutted and renovated a kitchen, two bathrooms, laundry room and a master bedroom and library for us. Each time the experience was exceptional. You couldn’t ask for anything more, they are Professional, on time, meticulously clean and perfectionists. Unlike some other contractors we have used, John is always on site and is doing the work and the pride he takes in his work were as if it were for his own home. I believe the philosophy at Gemini is how can we not just deliver a job well done, but rather how can we delight our customers and exceed their expectations. An example of this is a tiled shower ceiling they did for me. They did not make the size tile I wanted, and I asked John about cutting them for me. He explained that could be done but with the diagonal pattern I wanted and the slight offset in the walls it would be near impossible to do and have it look good. So I purchased a different tile and left it for them. I was excited beyond belief when I came home and saw that instead of the new tile I had purchased, John had painstakingly cut and set the original tiles I had wanted. The extra time, patience and effort required to create the ceiling of my dreams is just one example of so many that demonstrate their desire to deliver an exceptional experience. I would highly recommend Gemini to anyone and look forward to finding my next renovation project for them in my own home.